For a long time at Guidebook, we have wanted to understand how teams within a company can use our platform to communicate more effectively. It’s been especially powerful for companies with large, diverse workforces, or for those whose teams are geographically dispersed. These companies have built out arsenals of dozens of guides for their teams all over the world as a means of sharing information and communicating in real time. The internal communications app is not a new concept, but it is something we’d like to see more of. We figured the best way of understanding what having an internal communications app feels like would be to create one for ourselves, and put it to the test. Historically, you users have been really creative with using the Builder platform to create Guides for unique use cases. We love that. 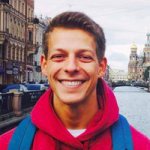 Summer intern guides, banana plantation guides – you name it. Well one in particular that’s been hugely successful, and that’s starting to catch on with more and more companies, is a multi-guide branded app that’s designed for internal communications within a company. These multi-guide branded apps make sense because it’s the logical step forward as companies expand their use of mobile apps, geared at optimizing internal communications. (One team starts the process, sees the utility behind it, and passes the usage onto other departments). The ability for teams within an organization to have one centralized place for easy-access materials is pivotal, and it’s an area where intranet systems have failed to deliver. Since we have offices in three countries and are headquartered in San Francisco, we were eager to bridge geographic differences and time zones. Internal communication is especially important with people working across offices, or from home. Beyond aiming to more effectively share information and communicate with one another, we’re always open to new and creative ways of on-boarding and enabling people in various departments. An internal communications app, we figured, could fill these voids, and reach us straight on our own phones. So we began building what was later named “Guidebot”, after our company mascot. Disclaimer: One thing to note here is that our process may be a bit different than for others. Before we actually started building out a product to fit our organizational structure, we first put ourselves in the shoes of our customers and employees. This way, we would truly be able to deliver value through both the end product, as well as the experience of actually building it. Building the Guidebot app was a collaborative effort including executive staff members and representatives from Marketing, Sales Development, and Customer Success. Each team within our organization volunteered to build out discreet guides for their departments, which were then housed within the master app, Guidebot. Teams looked at existing resources. Some already had guides and information, so this was then a matter of determining which would be leveraged within Guidebot. Many of you reading this have already set up individual guides. You’ve identified a need to go mobile within your organization, and acted. That’s great! Oftentimes our customers will start out with one guide for a single department or event, and over time add more and more, until a branded multi-guide app makes the most sense to collect all these disparate guides together. That was the situation that Guidebook was in. In our case, CSA team had a CSA guide and HR had an on-boarding guide, so those were more readily built out. SDR and Design teams had resources stored online. The Customer Success guide also had to tie in their Customer Success Training into the final product. All of these resources had to be organized and critiqued to determine which would be mobile-friendly. That is to say, your users are able to interact with an object / form on a mobile device without any issues. For this reason, you may want to avoid complex spreadsheets and files where zooming in and tapping requires unnecessary precision. Adding the Training Curriculum was an interesting process in itself – I had created this curriculum in Google Docs, so transferring content designed for laptop/desktop viewing to mobile was a fun challenge. I had to think about how many times someone would have to scroll to read content on the screen and how to restructure content using headings, bold formatting, and bulleted lists so it would be easier to read on smaller screens. Now it was time to brainstorm which additional resources would still need to be developed for the finished product. If this is to be an all-in-one source of quick information, what should our teams be able to access within the app? What should we leave out? In our case, it was great to be able to house important PDFs and documents within the app, but overcrowding the app with too many PDFs and large files was counterproductive. Next, we shared a list of steps & a timeline with participating teams about how the app would be put together and submitted. App organization and development only takes a few hours, so teams were never overwhelmed. From start to finish (including design, content development, implementation, and app store approvals) the team delivered Guidebot in less than a month. And trust us, this was not a full time job for any of the team involved. Far from it, most of the work was created, formatted for mobile, and uploaded into Guidebot in a handful of hours per guide. But for those who might not already have their content put together and organized, this process would take more like 5-6 weeks from start to finish. At this time, the team also mapped out a design timeline to brand the guide in typical Guidebook fashion. If you are considering an internal guide or branded multi-guide app, you’ll need to think about how to differentiate this “internal brand” from that of your other mobile apps (if you have any). Our Designer, Hannah, carefully crafted this out to create a distinct, playful brand for the Guidebot app. 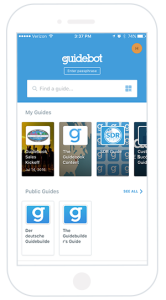 From the start, we wanted the app to have a similar look and feel to the Guidebook app, but be easily distinguishable at the same time. 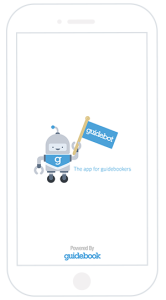 For the app icon we chose the Guidebot exiting the circle, the splash screen has a large Guidebot (keeping a playful look and feel we commonly use for internal materials), and the home screen is the inverse of the Guidebook app with a blue header. Collectively, everyone involved discussed which of Hannah’s mockups they felt looked best aesthetically. Some of our team members –Hannah, Gulnaar, & Max– began putting these new resources together and finalizing plans on what would be included in their guides. This was really where the creativity began to kick in. Consulting with their own teams, each of them formulated a plan for what the final product would look like and include. Now it was time to get their hands dirty with the actual build process. Hannah, Gulnaar, Max, and some others from their teams hopped onto Builder and began to build out their team’s own piece of the app. Team leaders are able to give Admin status to whomever they choose, so it was easy to delegate tasks. With the build completed, team leaders made sure all guides within the app were cohesive and followed a smooth flow across the whole app. Jumping from one guide to another shouldn’t feel like a shock to your user. If you look at Guidebot, you’ll notice everything runs on a similar wavelength. Our Developers helped to implement Single Sign-on (SSO) into the app. If you’re unfamiliar, SSO allows your users to log into Guidebook-powered apps using their existing company and/or organization credentials. A smooth log-in process ensures high adoption levels among your employees. Once everything looked good, Guidebot was submitted to the App Store for review. Pro-tip: The way submission to app stores works, at least one guide within the shell app must be published and public. Knowing this, to mitigate the waiting time for the app to be published, Gulnaar began by building out the shell app with one guide published in it, and submitted that to the App Store as soon as possible. That way, Apple can review and approve the app, while the internal team is simultaneously building out their individual guides within the app. Once these guides are completed, they can easily be added to the app, since Apple doesn’t actually need to approve those individual guides! Guidebot was approved and successfully released. Team leaders sent out instructions on how to download the app (and individual team guides), and our executive staff shared the app with the company as a whole. If any guides are password-protected, this can also be included here – as has sometimes been the case with specific events we’ve held within the app. A little extra security never hurts! The CSA Team’s internal guide on our Guidebot app is a combination of necessary information, resources to help us improve, and a plethora of inside jokes. The guide contributes to our team culture, as we work to find tools that unite us across time zones in offices around the world. The guide also contributes to our team’s continual improvement; there are important resources as well as reference documents in the guide to help us learn and to help us keep track of all the information we need in order to provide the best support possible. We continue to update the CSA Team Guide and use it during meetings, as we conduct miniature trainings for one another on features. Despite the fact that our initial goal was to test our own platform, we never “forced” the project. We learned early on that the most effective way of growing the guide was from a select few teams first adopting it. Then organically, other teams saw how it was being used and started to envision how they too could use Guidebot in a variety of different ways. Many people didn’t recognize how useful this was until they actually had the app in their hands, and were using it day-to-day for regular internal communications. Now that the guides have been built out, the main thing moving forward will just be to maintain the guides. As additional things need to be added (or we decide we’re not using specific parts of the app) changes will have to be made – which luckily, it’s easy with Builder. If you think your company would benefit from having its own internal communications app, it’s time to start thinking differently. We’re proud to have seen our clients think up this idea, and excited to start using Guidebot more in the future in unique ways. Get in touch with our team and we can start working out your vision together.